Home / What are seasoned logs? Seasoned logs have been left out to dry for at least 1 season. This is the natural and traditional way to ‘air dry’ logs. Seasoned logs are stored undercover with good exposure to air to aid the conventional drying out procedure. 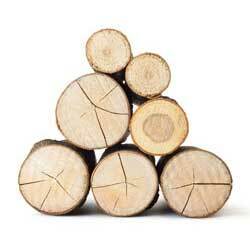 Logs that are dried during warmer months of the year are the best as there’s more chance of moisture being reduced. Softwood takes less time than Hardwood to dry out. Most hardwood like Oak can take more than a few seasons to reach the low moisture levels required for reliable burning. Read: Interesting article about how to season Firewood. Order a truck-load of logs and have them conveniently delivered, in a bulk bag on a pallet. We can deliver to any mainland UK address. You can book your delivery day. No need to be at your address to accept delivery. Your seasoned logs will be delivered between 9am-6pm on your desired day. We offer a money back guarantee and all queries will be responded to within 12 hours. Our seasoned logs have been sustainably sourced from British Woodland. After the hardwood logs have been sourced, they are taken to a sawmill to be processed. The logs are then cut and split using machinery that is powered by electricity supplemented by solar power. Once the logs have been cut, they are put into a red-hot kiln to reduce moisture content (making them even drier than regular seasoned logs). After the logs have been toasted in the kiln, they are tested by quality control to make sure they contain less than 20% moisture (logs don’t burn very well when they contain too much moisture). The kiln dried logs are then sorted into different sizes and bagged up to be delivered to any mainland UK address. 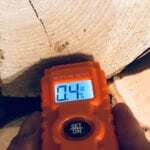 Less moisture = more heat meaning you need less logs. Our bulk bags of logs are 100% British wood, mostly Oak and Beech, which packs a punch when it comes to heat, so you’ll be getting value for money.